Most digital cameras save photos in a cryptic format that is not descriptive at all. The same can be true for other files, for instance for images or videos that have been downloaded from the Internet. 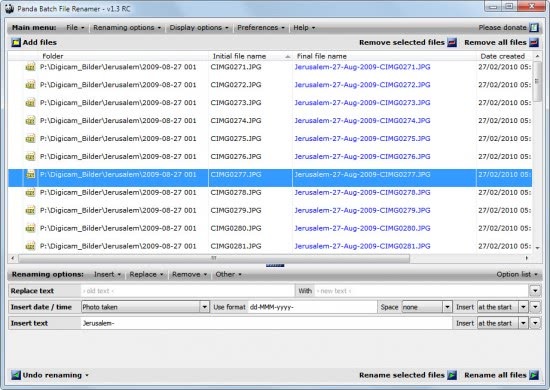 Panda Batch File Renamer offers an intuitive interface to rename photos, music, and general files. Files can be added from the clipboard or with the help of the built-in file browser. 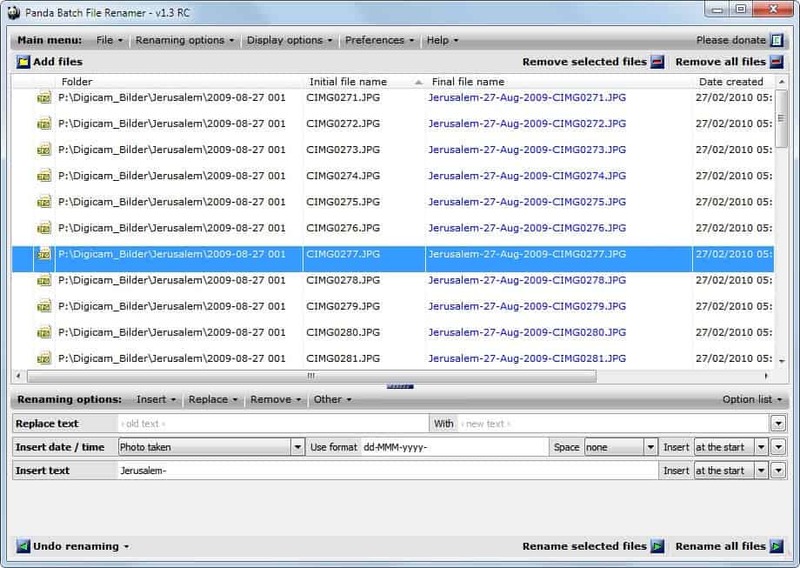 The files are then displayed with their folder path, original file name and final file name. The display options menu at the top offers options to add or remove parameters from the table. It is for instance possible to add meta data to the table. The program updates the final file name whenever renaming options are added, edited or removed from the application. The available renaming options are grouped into the four pulldown menus Insert, Replace, Remove and Other. Options range from adding, replacing or removing text to adding information from meta tags if available. It is for instance possible to add the date or location photos were taken to the file name (if they exist of course). Multiple renaming options can be selected and positioned. It is possible to use drag and drop, and the Insert menu to select locations for each renaming option. Each change is directly displayed in the program which can be used to verify the changes immediately. Panda Batch File Renamer offers to save renaming patterns to make use of them at a later point in time. Especially the options to utilize file meta tags and the ability to save renaming patterns make Panda Batch File Renamer an interesting application. The software can be downloaded from the developer website. It requires the Microsoft .NET Framework 3.5. Version 1.5 of Panda Batch File Renamer has been released.